Philip Blake, forgotten cartoonist. | Come Here To Me! In January 2011, we featured a post here on the site about Joseph Edelstein, who was a one time leading businessman in the Jewish community in Dublin who fell on hard times. 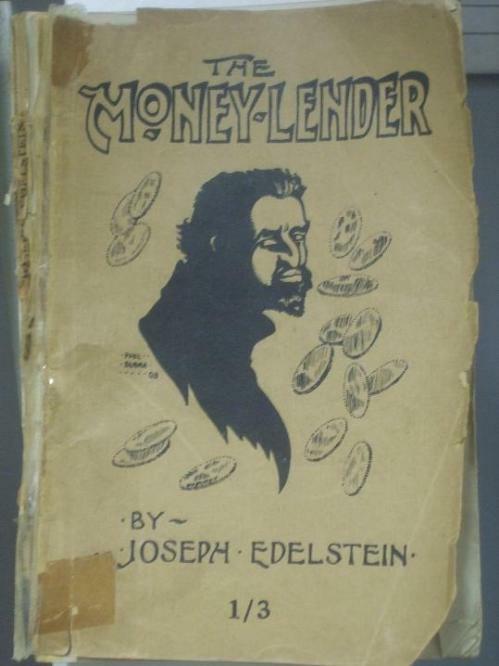 Edelstein had been an active Home Rule campaigner, active with the Judaeo-Irish Home Rule Association, and was the author of the hugely controversial text ‘The Moneylender’ in 1908. That text proved divisive among Dublin’s Jewish community, with some feeling it reinforced negative stereotypes. Below is the books cover, as on display today in the Jewish Museum here in the capital. Image I took in Dublin’s Jewish Museum in 2011. Philip Blake was the artist responsible for the cover of this book, though precious little is known about him. The Irish Comic News blog are appealing for information on Blake, and have an interesting post on him on their site at present. It’s a fantastic read, and details some of Blake’s work for the Freeman’s Journal newspaper. Anyway, Blake seems like an interesting character, but I haven’t been able to find out much about him. In the 1901 census he was 32 and living alone in a flat at Leeson Street Lower, Mansion House, Dublin, his occupation is given as “artist, cartoonist, newspaper illustrator, black and white” and his birthplace as Co. Meath. The Mormon genealogy site has a Philip John Blake, born in Castletown, Meath, on 19 January 1869, son of Philip Blake and Elizabeth Martha Cogan, as well as an older brother, Richard Thomas Blake; I’ve found the family in the 1901 and 1911 census, and Phil’s not at home either time, but Richard Thomas is there in 1901, so this looks like the correct identification. However, There’s no sign of Phil in the 1911 census. I’ve tried the England and Wales census and the Scotland census, but no luck there either. He’s either died or gone somewhere else. And I’ve found, formerly advertised on AbeBooks, an edition of Percy Bysshe Shelley’s poem The Cloud, published in Katoomba, New South Wales, Australia, about 1915, illustrated with photographs and “illuminated by Phil Blake & Co. Artists”. The chin of the female figure on the cover, below, suggests that this is our man. 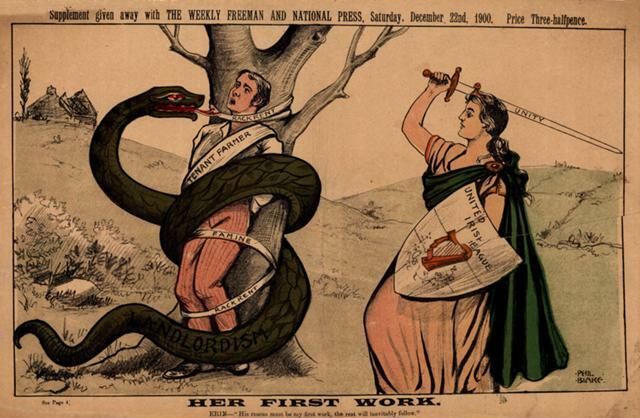 An example of Blake’s work for the Freeman’s Journal as featued on Irish Comic News. One of my favourite books in recent times was the collection of cartoons from the late Ernest Kavanagh, whose work appeared in The Irish Worker during the revolutionary period before his death on the steps of Liberty Hall during the Rising. While certain cartoons from our political past have become well-known, the artists themselves haven’t. If you know anything about Philip Blake, pop over to Irish Comic News and let them know. Will do. I was doing some research on him during the year and may have a few more details. Phil Blake pops up occasionally in turn of the century Joyce and popular culture references but only as a contributor to the Freeman’s Journal. Blake designed the cover to the programme for the Irish premiere production by The Players Club of Henrik Ibsen’s A Doll’s House performed at The Molesworth Hall, Dublin, 14, December, 1897. In 1897 there were five London productions. It remains uncertain if James Joyce attended this Dublin performance, but it is not unlikely, as his interest in Ibsen dates from this time. Phil Blake designed the scenery for this production. The reviewer in the Irish Times – “The Players Club A Doll’s House, 15 December, 1897 – maintained that the Molesworth Hall was unsuitable for the 1897 production which was nevertheless described as “an oasis in the desert” by the critic in the Daily Express (possibly Edward Martyn) – “Ibsen in Dublin” – 16 December, 1897. In about 1898 Phil Blake succeeded Thomas Fitzpatrick as chief cartoonist on the staff of the Freeman’s Journal. His art nouveau style was something of a departure. Blake appeared on the same bill as the then 19 year old Joyce in the Antient Concert Rooms in Miss Margaret M. Sheehy’s Dramatic and Musical Society performance on Tuesday, January 8, 1901. Phil Blake performed a song, “Save Me Not” that evening. Joyce appeared as Geoffrey Fortescue, an adventurer, in Sheehy’s short drama Cupid’s Confidante. A copy of the programme was happily retained in the Sheehy-Skeffington papers at NLI (and by Sylvia Beach in her personal collection). January 9, 1901: Freeman’s Journal praised Joyce’s performance as ‘a revelation of amateur acting’. James Joyce, in Aeolus a chapter of Ulysses, describing the production off the Weekly Freeman, refers to “Phil Blake’s weekly “Pat and Bull story”. The 1901 Census records Phil Blake as aged 32 (born Co. Meath in 1879), unmarried and Roman Catholic , living at 82.5 Lower Leeson Street. His occupation is listed as “Artist, Cartoonist, Newspaper Illustrator, Black& White”. The NLI electronic catalogue lists 52 political cartoons by him included as supplements to The Weekly Freeman et al. Thanks for posting this Donal, and for finding the cover of “The Moneylender”, and thanks to Patrick for the above info (some of which I’d found independently, much of which I hadn’t) and the scans you emailed me. Here’s the article on Blake on the Irish Comics Wiki – anyone who finds out anything more, they’re very welcome to add it. I’ve been researching for a historic costume exhibition at Stanton Library, North Sydney, NSW, and am using an illustration from a 1914 Mark Foy’s (Sydney department store) catalogue found in the Powerhouse Museum Research Library. The illustration, of a corseted lady, is signed Phil Blake in the same style as your Freeman’s Journal cartoon. So I would say your supposition that he relocated to Australia is correct! Belated thanks, Kelly – I’ve only just noticed your comment.